Sometimes there is a well defined question; there's a good answer to it, everyone is happy. But it "smells". The question stands on a weird base or anti-pattern. Maybe the question should be changed to the origin of the problem. I'm not saying a question like that has no meaning on its own, an of course, maybe it's not as 'smelly' as I think, but it should be discussed - and the comments usually don't help, because a good answer comes, and everyone wants to answer to get some points. I see this a lot. People are answering the 'literal' (sorry for the abuse of this word) question instead of going deeper. This question was flagged as a duplicate of A car with square wheels. I believe it's similar, but what I was looking for was something different. What I asked was as community, not as an individual. 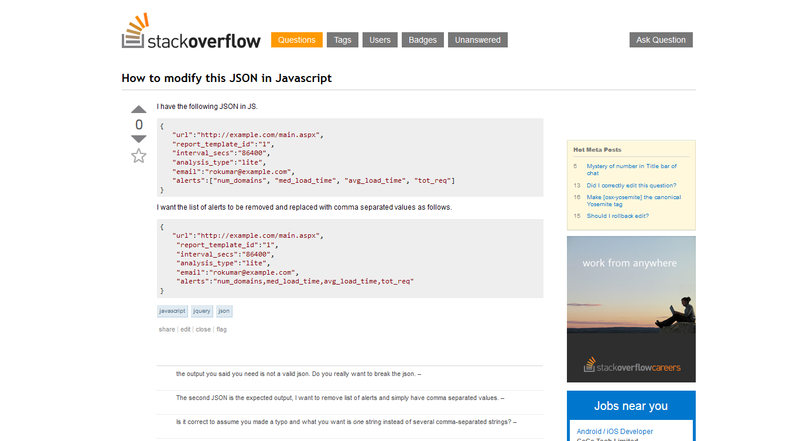 And going further, maybe someone can think of a feature for stackoverflow that might help. This was the intent of this discussion. Sorry for not being clear. Give reputation (similar to bounty) for someone for refining the 'square' question and answering the comments (this is bad because it's too vague, cannot think of a healthy mechanism). Flag this question/answer as 'square' will give a warning to the viewer (when reading the question or the answer): "WARNING: this question/answer might be a case of a car with square wheels"
We have no real choice but to answer the ‘literal’ question. It is what the OP asked and it is (likely) what will remain on record for a long time to be found and found useful by others. It might be doing one individual a bigger favour to correct a conceptual problem but that would only be at the expense of many others. In my experience, all sorts of weird and wonderful unconventional/not recommended approaches, when challenged, have turned out to have been determined to be the most expedient of the limited range available – with logic at times being no more sensible than “that is what I have been told to do, much against my better instinct, and all my arguments have failed to convince the powers that be”. It must be particularly galling for someone coming to SO, knowing full well what he is asking about is far from optimal to be told (often by people with less grasp of the technology, let alone its particular environment) "You don't want to do that". XY problems are horrible because they often turn into chameleon questions, as X moves to Y, and clutter up page after page with comments. The accepted answer may then have little bearing on the question as asked, which does not help others. By all means explain ”this is not the recommended approach”, go further, outline enough to facilitate searching for information on the recommended approach, but above all answer the question. If necessary, get OP to asked the one they should have in addition. If I end up with a mismatch between Q and my accepted A, I change the question. Do we need a general reference question for “ReferenceError: libraryName is not defined”? Well intentioned worsening of question?